So why does Chick-Fil-A Advertise on Sundays? 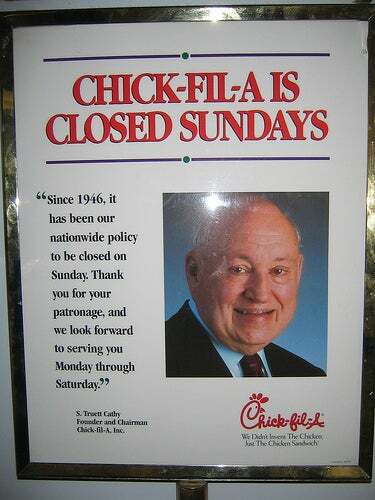 So why does Chick-Fil-A advertise on Sundays? How does this not violate their whole Family Values schtick? Someone is having to work on a Sunday to get the ubiquitous Chick-Fil-A cow commercials on relentlessly during NFL games. Shouldn't that person or persons (and I quote) "...have an opportunity to rest, spend time with family and friends, and worship if they choose to do so."? Shouldn't their policy apply up and down their whole market value chain? Or do they just not care about anyone who is not a visible part of a store's operations? It makes you wonder about other parts of their supply chain. Are their semi-truck drivers are at home on Sundays and to heck with Monday morning deliveries? Are their bread suppliers cranking out fresh biscuits and buns on Sundays to be ready for Monday or do you get two-day old stuff on Mondays? All that said, I could give a hoot whether a company is open on a particular day of the week, but if you are going to piously crow about it, you should shut down everything, not just the readily visible parts.